When I watch a movie, I want to do so by having the best soundbar possible. Soundbars are great since they can deliver high-quality sound while enjoying a good movie. They also save you space, are not complicated to set up and offer the same experience as a home theatre system. Soundbars are long so you will need enough space for them. But, once you’ve found the perfect spot, it won’t get in the way of anything else. Soundbars don’t have to be expensive to offer a fantastic sound and the best sounbar models on this list is proof of that. If you are looking for some of the best Soundbars worth purchase, then stay tuned as in this article, I’ll showcase 11 best soundbars under $200-$300. 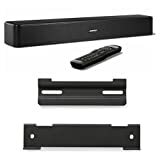 All these soundbars are available on Amazon and you can easily purchase if you want. So without further delay, let’s find out which are the best soundbars under $200-$300. 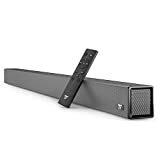 The TaoTronics 40 Watt 36-Inch Soundbar is one of Amazon’s best selling soundbars. This beauty features two full range and mid-low frequencies and 10W speakers. You can either control the soundbar with the buttons it has or the remote it comes with. It also has LED lights whose color changes depending on what you’re using it for. There’s also the dual wired & wireless installation thanks to the Bluetooth feature with a 33 ft range. There are various ways to connect the soundbar. For example, you can connect it to the line in, included cables, or the RCA. It sells now for $79.99. 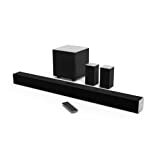 For, the WoHome 38-Inch Wireless Audio Soundbar, ($109.98) to fit under your TV you’re going to need a little more space. The package with this purchase includes a total of four pieces. There’s the 2.0 channel soundbar, a 15-watt full range speaker, and 2 10w speakers. You can either connect the soundbar with the traditional cables or use the speaker’s Bluetooth 4.0 feature. The wires do have a 33ft/10 meter limit, just in case you need to stretch it out a bit. The surround sound you’ll enjoy is made with DPS Technology, so you’ll enjoy what you’re listening to. 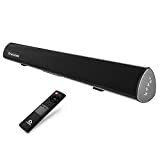 This soundbar also allows you to control it through the soundbar or through the remote it also comes with. The mount kit is included with the purchase, just in case you want to place the soundbar on the wall. 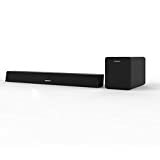 Wired and Wireless: pair via Bluetooth 4.0 from up to 33 ft, lets you enjoy high-quality audio and lose wires; or choose wired connection including RCA/USB/optical inputs, what's more, optical/RCA cables provided. The ZVOX is so easy to install the manual is only a page long, so it doesn’t get any easier than that. Have you ever set the volume at a certain level and it’s perfect for the program, but it’s too loud for commercials? With the Output Leveling feature, a processor takes over that makes the softer sounds louder and the louder sound softer. The volume adjusting is done for you. This feature also works with Blu Ray and DVD. The soundbar also has a four-digit display where you can see the current settings. 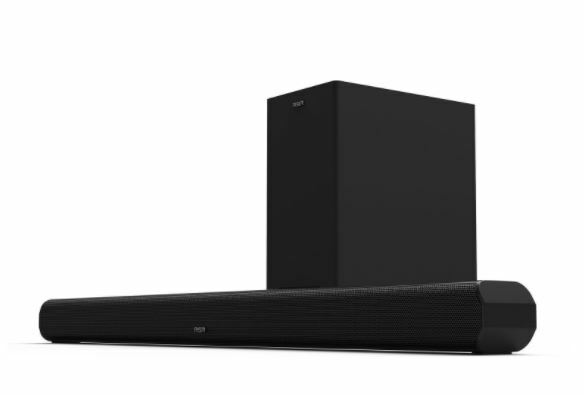 The Vizio SB3851 38-Inch Soundbar has its own unique feature too. It comes with some fantastic satellite speakers for you to enjoy. With this soundbar, you’ll enjoy a complete 5.1 channel true surround sound that delivers 100dB of crystal clear sound. This soundbar also features Bluetooth technology and premium audio Dolby Digital and DTS Studio. You also get (besides the soundbar) two additional speakers and a subwoofer. You can either place the soundbar on the wall or near your TV. It’s currently available for $229.99 but price is subjected to change as I have noticed earlier as well. A list about the best soundbars would not be complete without the Sony HT-CT80 Soundbar Home System. This sound system is a 2.1 channel surround sound with an S-master and a wired subwoofer. Do you want to go wireless? You can and stream your favorite music wirelessly from specific smartphones or tablets by using the NFC One-touch feature. 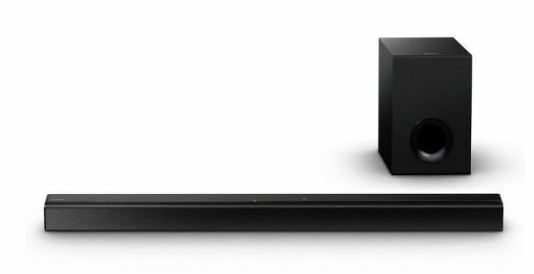 The Sony HT-CT80 is a two-way speaker bar and you can either mount it on the wall or place it on a piece of furniture. The soundbar can deliver 80 Watts of power and a 2.1 channel sound as well. If you think that this is the soundbar for you, you can get it for $279.95. 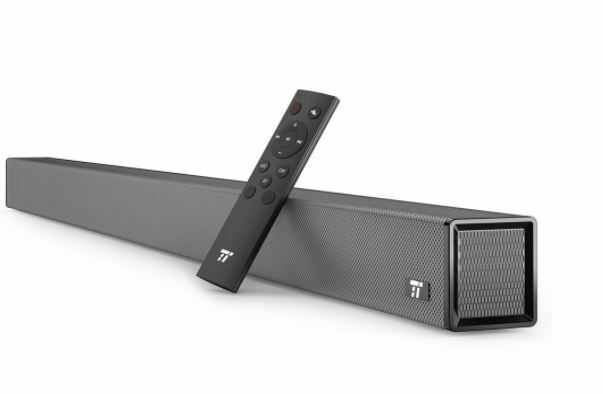 The LuguLake TV Soundbar is longer than the previous models on the list with 39 inches. This soundbar gives you 40W of strong audio and high-fidelity so you can watch your favorite movies or programs. It also features 3D surround sound DSP and wireless remote control. The remote is an IR remote with a range of 33Ft/10M. You can even count on multi-connectivity. For example, you have RCA, 3.5mm audio jack input, RCA audio output, and an optical converter. The Lugulake soundbar sells for $69.99. The Megacra Bluetooth Audio Soundbar is Amazon’s number one seller. It can be all yours for $99.99, yes, all 38 inches of it. It can deliver 100 watts, 2.1 channel sound with wire subwoofer. You can stream music wirelessly thanks to the Bluetooth 4.0 technology. Enjoy the adjustable bass and treble, but with a smooth setup. The company is so convinced of its quality that they are even willing to give you an 18-month quality guarantee. 2.1 channel 100 Watt soundbar delivers a remarkable sound and excellent sound quality. Wired subwoofer enhances your TV experience and provides strong bass when you're watching your favorite movies and shows. DSP Technology: With integrated DSP (movie/music/dialogue) technology for amazing clarity and precision, it brings you an upgrading fantastic experience. 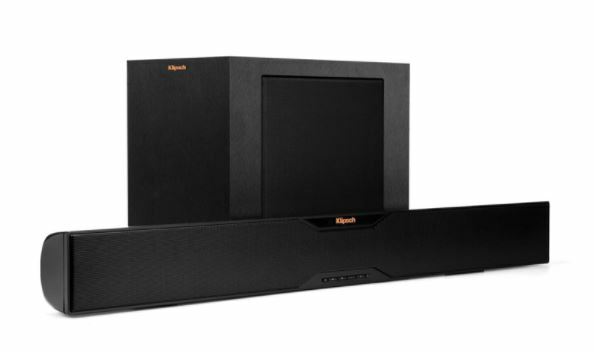 The Klipsch R-10B Bluetooth Soundbar is available right now for $279.99. 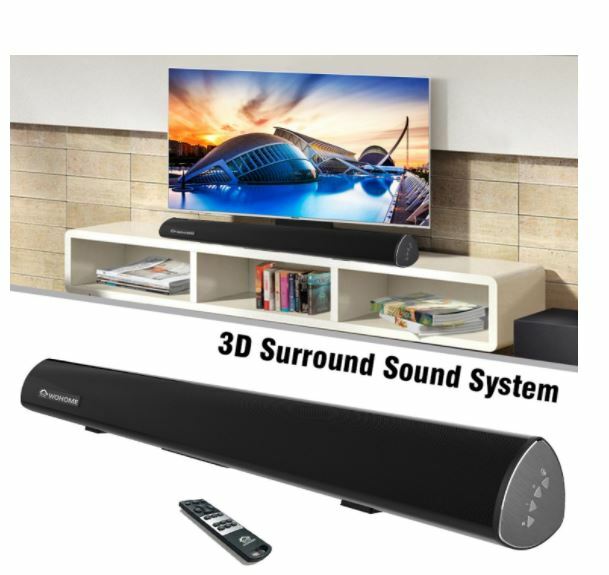 The features for this soundbar include a 250W peak power output, a true 2-way soundbar, wireless 8-inch side-firing subwoofer, solid MDF cabinet with a slot-port design for the best possible sound. The soundbar supports the majority of Bluetooth wireless technology and aptX Audio coding technology. It comes with a remote control that’s the size of a credit card, and it also has a great design. 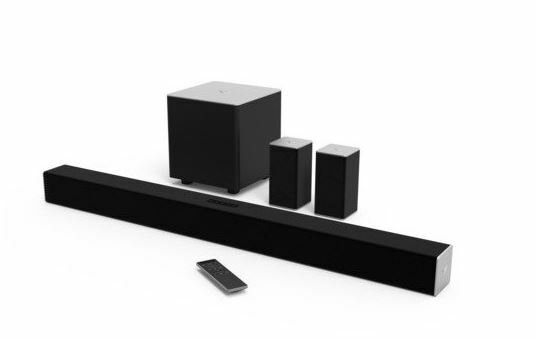 The well-known company Bose also makes its way onto the list with there Solo 5 TV Sound System with Bluetooth Connectivity Soundbar. 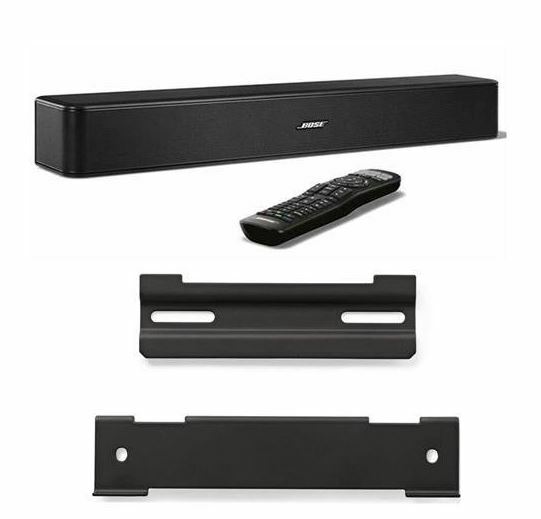 With this purchase, you get the Bose soundbar, the remote and the wall mount kit is also included. This soundbar does include the wall mount kit, so if you want to put it up against the wall, you’ll just need someone to help you. This model features a 5.1 center channel speaker, weighs 6.35Kg, a complete remote control, but it doesn’t have NFC or HDMI ports. It’s all yours for $ 273.00. Yamaha is another trustworthy brand that also has a soundbar for you try out. 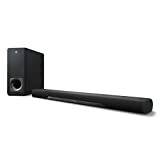 For $224.96 you can be the proud owner of the Yamaha YAS-207BL Soundbar. 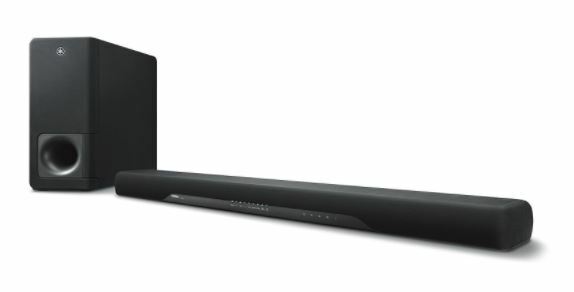 The soundbar comes with a wireless subwoofer, HDMI inputs, 4K HDR compatibility, Bluetooth, and DTS. The Yamaha soundbar delivers excellent sound, but it does lack an on-screen display for your TV. The Richsound Research Soundbar is not as expensive but still, gives out good sound. It will only set you back $119.99, and for that, you enjoy specs such as a 32-Inch 120 Watt peak power output. It also comes with Bluetooth, it’s wall mountable, 1 optical input, 1 HDMI ARC, and 1 Aux-In jack. There’s also a 12-month manufacturer warranty. It has a sleek black design that will blend into the background, so you can just enjoy the sound it delivers. Everyone wants great sound when watching a movie or their favorite TV shows. You just have to know which soundbar to buy to achieve that goal, but that may not always be an easy task. The options mentioned on this list will help you enjoy the best possible sound with a soundbar that’s within your budget. If you need to help with deciding which model to go with, reading the customer reviews can help you decide which one to go with. It will give you insight from users who already have it if it’s the one you’re looking for. Which soundbar model do you think you’re going to get? Don’t forget to leave a comment and share your thoughts.